The fall/winter 2018 edition of Grand Vie: Luxury in Living magazine, the luxury-home publication of Ebby Halliday Realtors and Fort Worth-based Williams Trew Real Estate, recently mailed to more than 60,000 luxury homes across the Dallas-Fort Worth area. As the magazine’s market update feature, “Luxury Home Market Spotlight,” points out, the North Texas region’s thriving economy continues to spur growth in luxury home sales. In the past year, 5.9 percent more homes priced at $800,000 and above have been purchased in the region than during the prior 12 months, according to North Texas Real Estate Information Systems, Inc. MLS statistics. 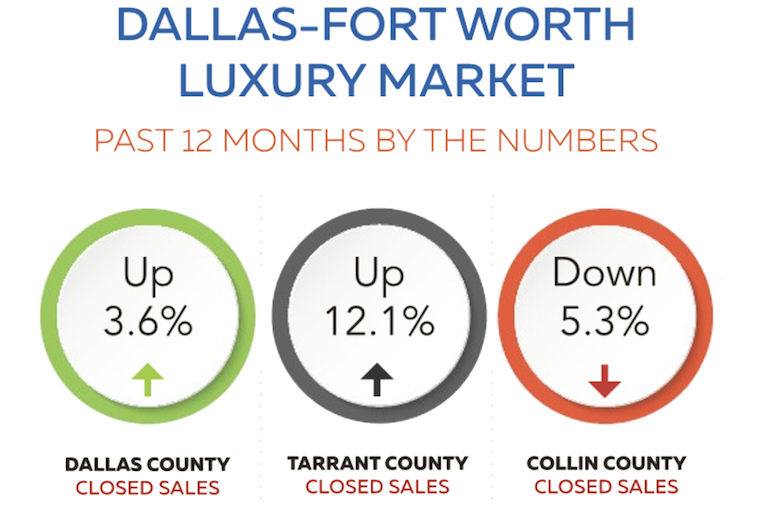 Luxury home sales are up 3.6 percent in Dallas County, 12.1 percent in Tarrant County, and down 5.3% in Collin County. In addition to featuring some of Dallas-Fort Worth’s premier luxury properties, the 26th edition of Grand Vie offers a plethora of interesting editorial content, including “Add a Little Sparkle to Your Holiday,” featuring the Jay Strongwater Collection; “At Home with Mayor Betsy Price,” offering a peek inside the favorite room of Fort Worth’s mayor; “Fresh Openings,” showcasing new retailers and restaurants around town; “Houses of Art,” featuring some of the area’s top cultural events of the season; special sections for lake, farm, ranch and recreation properties; and LuxeTrends, showcasing a collection of the latest luxury lifestyle must-haves. Also in the fall/winter edition: Partner and designer at IBB Design Fine Furnishings, Shay Geyer, shares insight into permanent botanicals for your home. View the digital version of Grand Vie to learn more about the North Texas luxury home market and the extraordinary homes now available at grandviemagazine.com.